Riviera Nayarit Mexico Blog: Prepare To Enjoy August Events In The Riviera Nayarit! 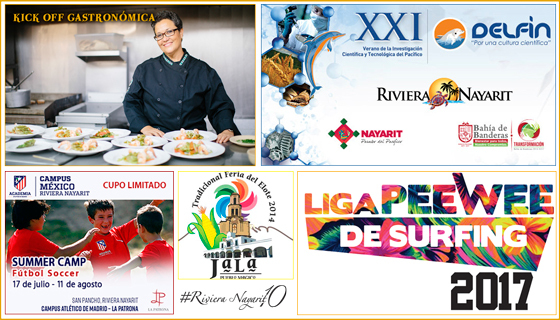 Prepare To Enjoy August Events In The Riviera Nayarit! · The Corn Festival in Jala and Xalisco; the Gastronómica Kick Oﬀ with its group of top chefs; the Grupo Delfin convention; and the Pee Wee Surfing League en Sayulita and San Blas are the top events this month. Spain’s Club Atlético de Madrid will be holding a Summer Camp - San Pancho Campus in the Riviera Nayarit at the La Patrona Polo Club (July 17 – August 11). This will include four weeks of training for kids and teens. For more information call 044 (322) 146 7714 or 01 (322) 297 2334 ext. 106. Top chefs both domestic and international unite in this culinary event that will be held within the Vidanta complex. Big names in Mexican gastronomy include chefs Paco Roncero, known for his mastery of Spanish vanguard cooking; Aaron Mizrahi and Elías Sapién, both banquet pros; and Betty Vázquez, the Riviera Nayarit’s Culinary Ambassador. The National Convention for Scientific and Technological Research of the Pacific is derived from the Inter-Institutional Program to Strengthen Research and the Pacific Graduate Program, and is also known as the Delen Program. The Delen Program is focused on strengthening the culture of collaboration between centers of higher education and the research centers that are part of the Program via an exchange with professors, researchers and students and the distribution of scientific and technological programs. Some 3,500 attendees are expected to be staying in the destination’s hotels in the area of Nuevo Vallarta. On August 26 it will be San Blas’ turn to receive this traveling tournament, which visits the different seaside villages along the coast of Nayarit in an effort to discover new talent in this extreme sport.